Mr. Danny Shenar is an Associate at the International Institute for Counter-Terrorism (ICT), Interdisciplinary Center (IDC), Herzliya. Mr. Shenar recently retired after more than 40 years of service in various security management positions with the Government of Israel as a civil servant. Mr. Shenar served as the Head of Security, Emergency preparedness and Cyber Security Division of Israel Ministry of Transport since 1987. He is a world renowned Security expert specializing in Transportation, Aviation and Marine security combined with multidimensional capabilities of security technologies implementation, addressing Cyber Risk through Cyber Resilience and emergency preparedness and response. Leading the Security Emergency & Cyber division, Danny gained vast experience in the fields of aviation, maritime and mass public transport security. He developed cutting edge security methodologies & systems to mitigate the ever evolving terror threats in Israel and worldwide. Responding to the development of the global terrorist, Mr. Shenar initiated and carried out numerous bilateral and multilateral collaborations worldwide with foreign governments, regulators and law enforcement agencies; structuring functional international cooperation frameworks, for joint prevention and response to local and International terror threats. In recognition of his professional contribution, Mr. Sehnar was nominated as the Chairman the G8 (the Group of Eight Industrialized Nations) International Working Group Land transportation Security for the year 2015. Mr. Shenar maintains vast personal and professional relationship with leading international security regulators and agencies worldwide. Mr. Shenar successfully implemented cutting edge security technologies, including unique advanced computerized systems for automated early detection of impending threats. 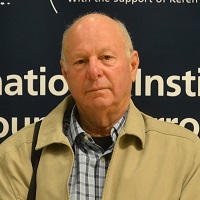 Previous to his service with the Israel Ministry of Transportation, Mr. Shenar held senior security management positions with The Ministry of Finance Custom & VAT Division (1981-1987); Ministry of Foreign Affairs (1977-1980) and the Israel General Security Agency (1972 – 1977). Mr. Shenar holds a Bachelor degree (BA) in Political Science from the Haifa University. In a previous article discussing many of the terror attacks against the aviation industry over the last few years, we reached the conclusion that the threat to civil aviation is likely to become more serious. As part of the development of methods and techniques of the terrorist organizations, we are witnessing the constant exploitation of the limitations of today's common security measures, especially in regard to passengers’ and hand luggage inspection, detection of homemade explosive materials concealed in baggage, detection of explosive devices in air cargo, and coping with an 'insider' threat.